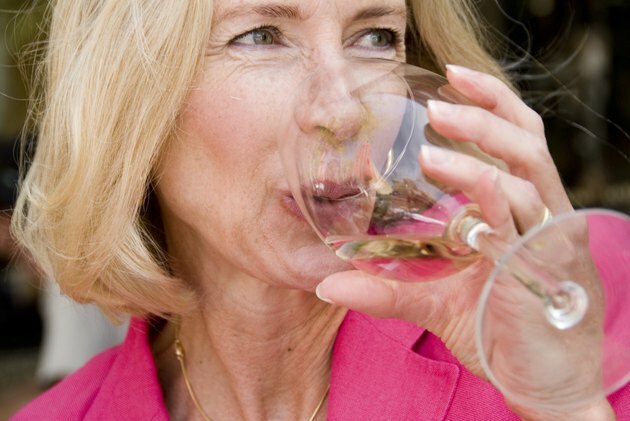 If you develop allergy-like symptoms after drinking wine, you may be histamine intolerant. Drinking a glass of wine can cause shortness of breath, sneezing, flushing, headaches and skin rashes if you are intolerant to histamine, according to the Auckland Allergy Clinic. Histamine is a chemical created in the human body that is also found in various foods and beverages. Most people can metabolize the histamine in wine, beer and other foods, but if you're intolerant, the histamine in wine will cause adverse reactions. Although histamine intolerance will cause allergy-like symptoms, the adverse reaction isn't an allergy. An allergic reaction is the result of a malfunction of the immune system that triggers a chemical chain-reaction throughout the body, while intolerance is the inability to digest or absorb certain ingredients in a food or beverage, according to Histamine.com. Histamine is the primary chemical produced during an allergic reaction in soft tissues, but it's only the result of particular antibodies that develop during an allergy. Histamine intolerance isn't an allergic reaction because your immune system is not involved in the symptoms that develop. A 2001 study conducted by the Auckland Allergy Clinic found that 22 out of 28 participants developed allergy-like symptoms after drinking a glass of wine. Red wine contains considerably more histamine than white wine. White wine contains between 3 to 120 micrograms of histamine per glass, while red wine contains between 60 and 3,800 micrograms of histamine per glass. Since your body cannot metabolize the histamine found in wine, the histamine levels in your body increase. Histamine in low doses help to defend the body against infectious organisms, but too much histamine will lead to inflammation in soft tissues, such as in the lungs, nasal passages and skin. Histamine will also cause your muscles to become constricted, which could cause asthmatic symptoms to develop within a few minutes of drinking a glass of wine. As histamine levels increase in your respiratory system you may develop shortness of breath, chest pain, chest tightness, trouble breathing and wheezing. Wheezing is a high-pitched sound made by your windpipe that results from restricted air flow. Wheezing is commonly accompanied by a constant cough. Your nasal passages can swell, cutting off your ability to breathe through your nose. This can lead to sinus pressure, headaches, facial tenderness and sinus congestion. You may also develop itchy eyes, scratchy throat, sneezing and skin flushing. Common digestive symptoms may include bloating, stomach pain, cramping, diarrhea, vomiting and nausea. Skin reactions include hives, skin redness, inflammation and eczema in some cases. Histame: What Is Food Intolerance?